I have a friend who was renting an apartment for a couple of months in Turkey. Since he was going to be there for awhile, I asked if he’d mind having my two friends and me come for a visit. It turned out his apartment was too small for so many visitors so we’d need to get a hotel. He was staying in the resort town of Kusadasi, which is about 45 minutes outside of Izmir, so we decided to use Izmir for our base in the area. Since most international flights fly into and out of Istanbul, we’d spend time there after leaving Izmir. While we were in Izmir I knew we’d want to take a tour of the ancient city of Ephesus and we wouldn’t have a car so I did something that’s a bit of an anathema in the points & miles game: I contacted a travel agent. I have a friend here in town who is a Virtuoso agent yet knows my preference to plan as much as possible myself and she put me in touch with a Turkish Virtuoso agent who helped us greatly. I’ll have more on how they helped us but it’s not always a bad thing to pay for travel. We flew from three different US cities and met up in London before continuing on to Istanbul. We spent a night there before flying to Izmir, where we spent four nights. We then flew back to Istanbul for five nights before returning home. Stay tuned for the trip highlights as well as details on booking the flights. 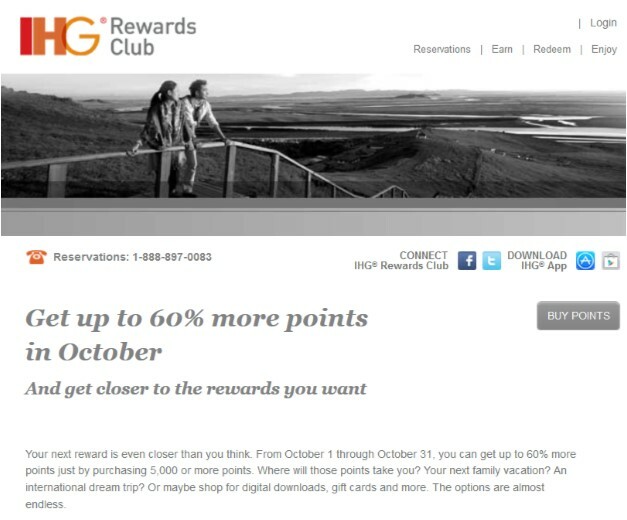 IHG Rewards Club is featuring a bonus on purchased points this month. The bonus depends on how many points you’re purchasing. I’ve got a nice stash of points at the moment so I’ll sit this one out. 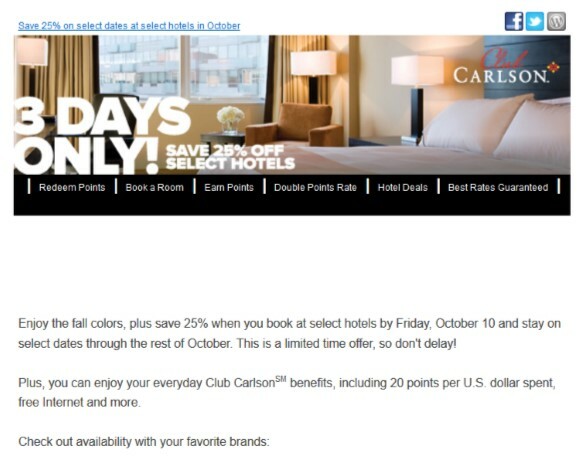 Club Carlson is having a sale at select hotels when you book by this Friday, October 10 and stay on select dates through the end of the month. Talk about restrictions! Since I just returned from vacation I won’t take advantage of this either. I’m not an aviation geek by any means but one of the few planes I can recognize on sight is the Airbus A380, since it’s a full-length double-decker. 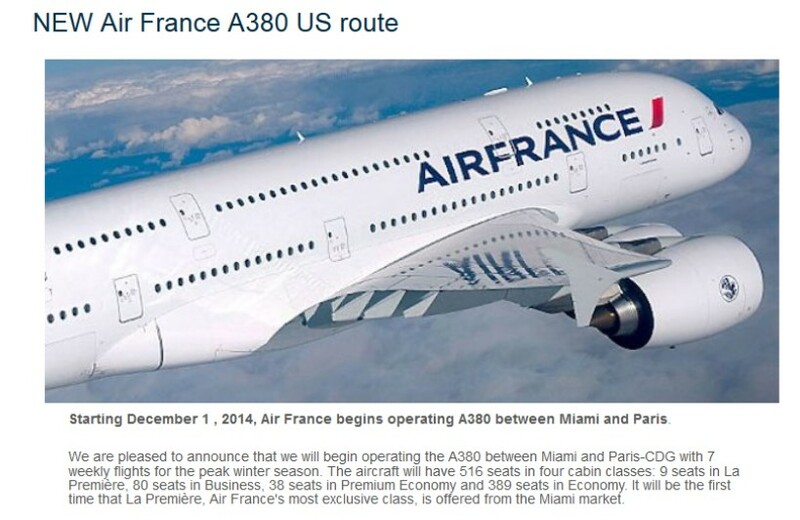 Air France is starting a new route, Miami to Paris (CDG), on December 1st. Remember Air France is part of SkyTeam which means you can use Delta miles on this flight. Sadly, Delta will not allow you access to La Premiere (first class) and if you book before the end of the year a one-way ticket will cost as much as a round-trip. However, Air France’s Flying Blue program is a transfer partner of both Starwood and Amex Membership Rewards, so that’s the way to book first class on the new bird. And finally, if you hold one of the Hilton co-branded credit cards (Amex has two, Citibank has one) you should have received this offer via email. 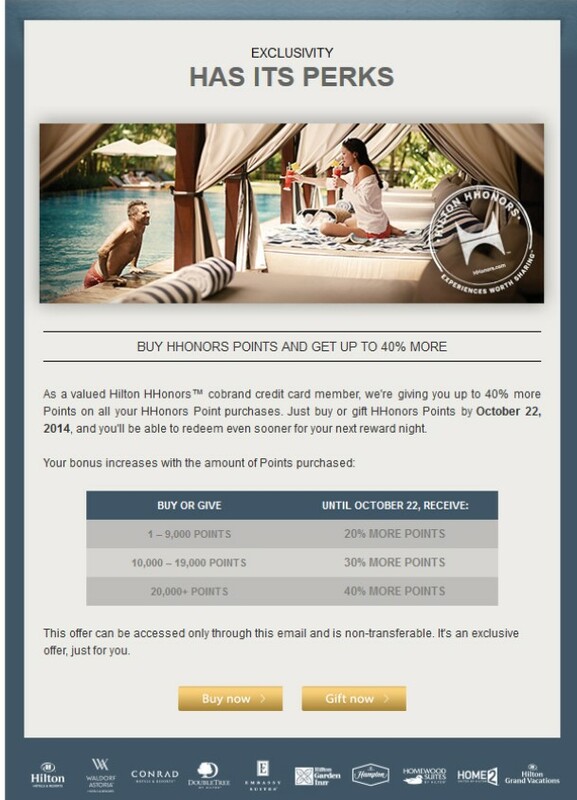 The link in the mail is specific for each recipient but you can buy or give Hilton HHonors points until October 22 and get a bonus, depending on how many points you buy or give. Might be a nice way to top off your account if you’re just a little short. 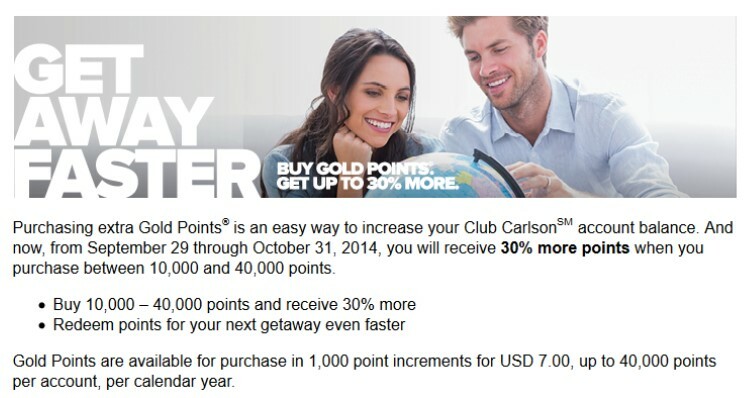 Between now and the end of the month you can get a 30% bonus if you buy 10,000-40,000 Club Carlson points. I recently points for a two-night stay at the Radisson Blu in Istanbul. If you also have the Club Carlson credit card, the last night of any multi-night stay is free! Click HERE to learn more. 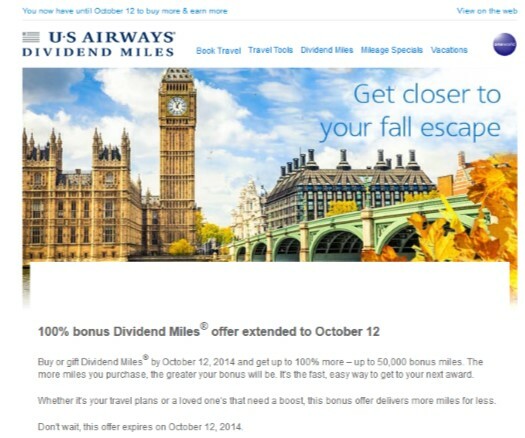 Buy or gift US Airways Dividend Miles through October 12 and get a 100% bonus. Click HERE to be taken to the US Airways site. Book your next Hyatt stay via their mobile app and earn a 1000 point bonus. There doesn’t seem to be any limit and it’s good through the end of the year! Click on the HERE to be taken to the Hyatt site. 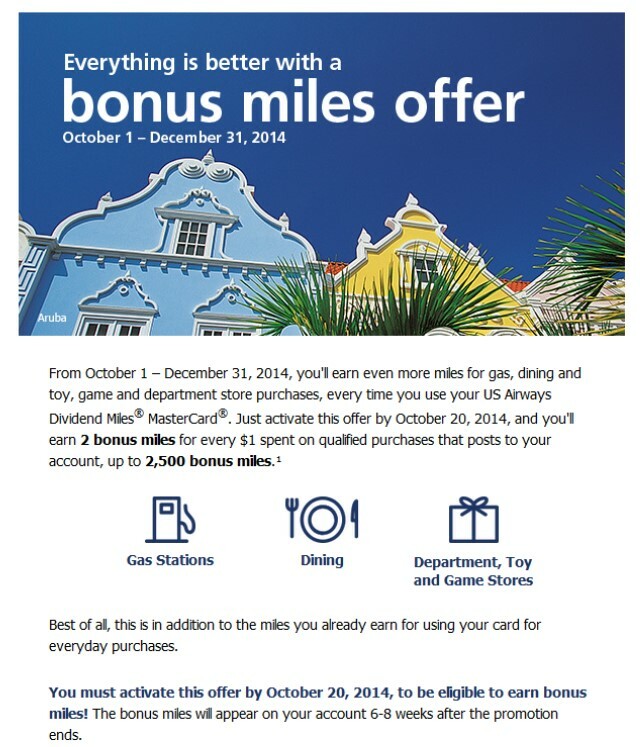 Use your US Airways Dividend Miles MasterCard at gas stations, restaurants, toy & game stores and department stores through the end of the year and receive up to 2500 bonus miles. That’s a bonus of spend in these categories up to $1250. You must activate this offer by October 20th! If you’re already a cardholder, you should have received info about this offer already. That’s it for now. I’ve got some more updates coming including a report on my recent trip to Turkey. Stay tuned!